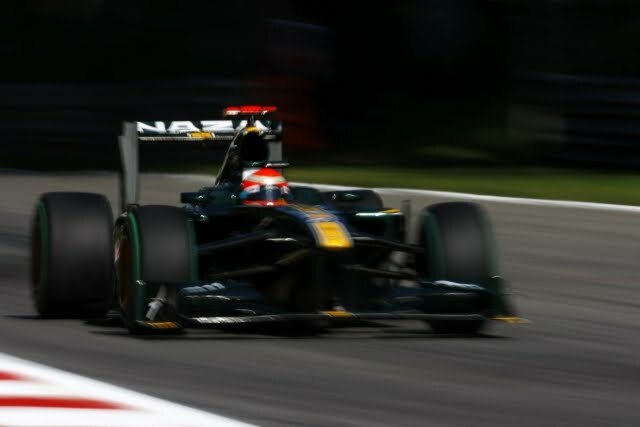 A tight Formula 1 points race between the past driving champions of McLaren and the rising stars of Red Bull Racing, the fast Italian 3.6 mile Monza race circuit, the 2010 Formula 1 enters the Italian Grand Prix with the potential of a thrilling event on Sunday. Two days prior to this anticipated Grand Prix, a free practice sessions of Friday provided some valuable shakedown time on this second low-downforce track in a row for the Formula 1 teams. On the Friday session McLaren's Jenson Button topped the first Friday practice round but it was Red Bull Racing's Sebastian Vettel who led the faster, later afternoon practice session. Storming around the 3.6 mile Italian Monza complex in 1 minute, 22.839 seconds, Vettel out ran Button's morning session by more than 8/10ths of a second. For the German Red Bull Racing driver, the trip back to Monza is the return for where his Formula 1 greatness was realized. Only two years ago, the still green Sebastian Vettel grabbed a surprise victory at Monza for Red Bull Racing's satellite team Toro Rosso Racing. Within the Red Bull Racing organization, Vettel's pace through both sessions is beating Australian teammate Mark Webber handedly with the second Red Bull-Renault 6th fastest following the 2nd practice. In pursuit of Vettel, Fernando Alonso as well as teammate Felipe Massa recorded the 2nd and 3rd quickest times on Friday afternoon practice charts little more than 2/10ths of a second off the Red Bull-Renault. Hometown hero car builder, the Scederia Ferrari team is certain to be providing much of the ambient crowd noise over the Monza track. An equally strong McLaren-Mercedes effort led by Lewis Hamilton over Jenson Button following the red Ferraris by at least 1/10th of a second. The conclusion of the Belgium Grand Prix two weeks ago at Spa-Francorchamps circuit saw the McLaren-Mercedes of Lewis Hamilton persist to clinch victory after a late safety car. Ending well for McLaren Hamilton and Red Bull Racing's Mark Webber, both driver's teammates failed to score points in that late August Formula 1 round allowing the two drivers to breakaway in the points standings. With Lewis Hamilton currently a mere 3 points ahead of Mark Webber, the gap is 28 points back to 3rd place Sebastian Vettel and 32 points in front of 4th place Jenson Button. Of course, with the new the 2010 Formula 1 points as well as 6 Grand Prix races including the Italian Grand Prix left to be run, these season race winners are by no means out of the fight. 5th place Ferrari driver Fernando Alonso 41-point gap on Hamilton keeps the 2-time Formula 1 driving champion in the hunt. However, the Spanish driver Alonso needs to not only win Grand Prixs but the respect of the FIA Formula 1 stewerds who have been catching too many incidents that cost the Ferrari pilot valuable track position.